Every collector, especially who start collecting 15 years back, knows very well the UT brand. 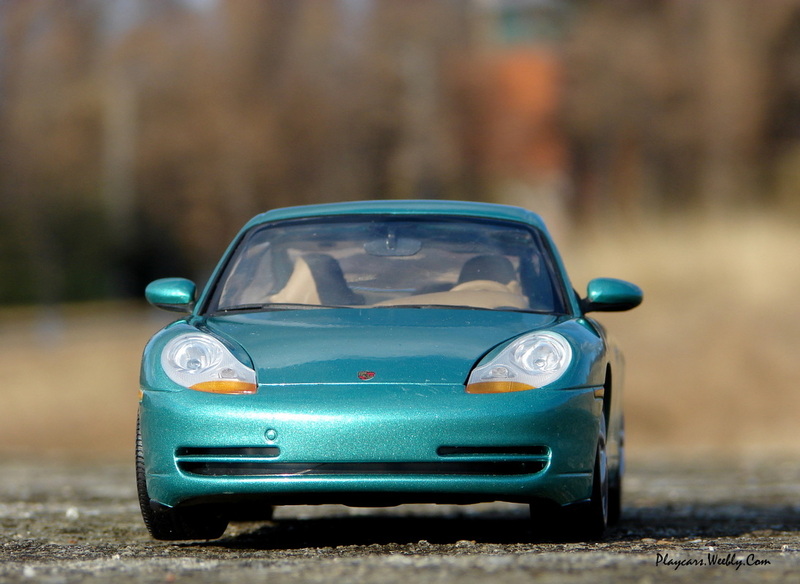 I can say they are the promoters of the premium models, releasing better crafted, painted and detailed models in comparison with the usual models of the time. UT is notorious for having released some of the most exotic and desirable models in the hobby, still valid today. 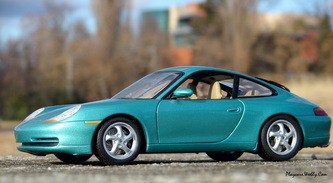 My first contact with their products came with the Porsche Carrera 911 (996). 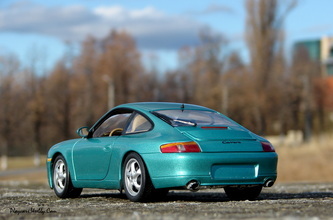 Looking the model, after more than 10 years it appears to be very similar with the first generation of AutoArt models. Of course some differences in matter of details are present. But, let’s make a closer inspection of the model. 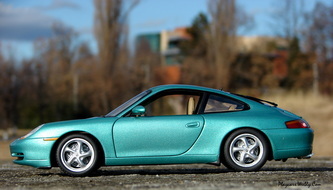 I ‘ve chose for my model the beautiful shade of turquoise, applied on it perfectly. 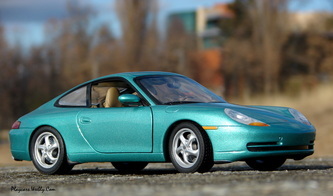 Is thin, smooth, metallic, glossy and without visible differences between the painted metal and plastic parts. 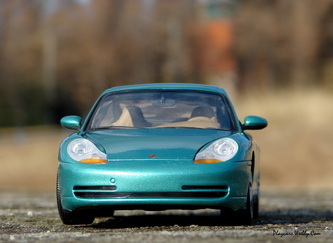 Isn’t a heavy model, having the bumpers made of plastic, but has correct proportion and stance and the shut lines are minimal. Good work at the lights level, without visible attaching stubs and correct colors of the translucent plastic. In fact are looking very actual. They’ve chose to represent only by painting, the lateral turn signals and the third stop light. The car’s logo and lettering on the rear lid are tampo applied. Unfortunately, the front air vent isn’t covered with mesh, only a transparent plastic was used and for the present standards isn’t the best option. Looking on the rear side we can find the first issue. All the visible parts of the engine, underneath and the exhaust system including the final pipes as well, were silver painted just to replicate the aluminium. But, in time, the paint is peeling and every time you’ll manipulate your model, paint residues will be present everywhere. The best solution is to clean this zone with a soft cloth, even if I must mention isn’t a general problem for all models. Looking forward to the wheels, are correct and precisely made, following the intriguer turbine pallets look of the real counterparts. Are marked with the Porsche logo in the middle, but something bad happens here. 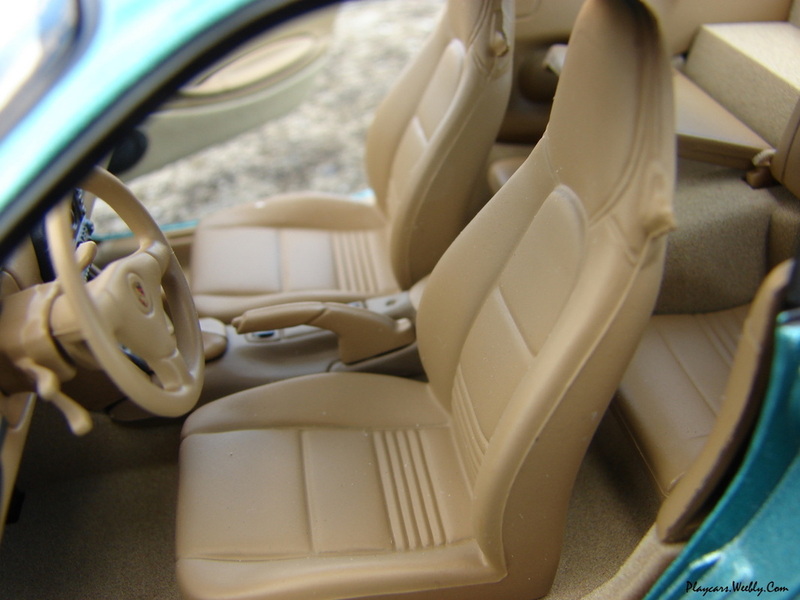 In tires composition they used a substance- a petroleum compose, which in contact with the plastic will makes it become soft, like the plasticine. So, the rims are very soft, if you’ll touch them stronger, even your fingerprints will be visible on their surface. Good detailing for the brake system having the brake disks dimpled to fake crossed drill along with painted and marked calipers. Because of its age the dog-legs hinges are present on doors. 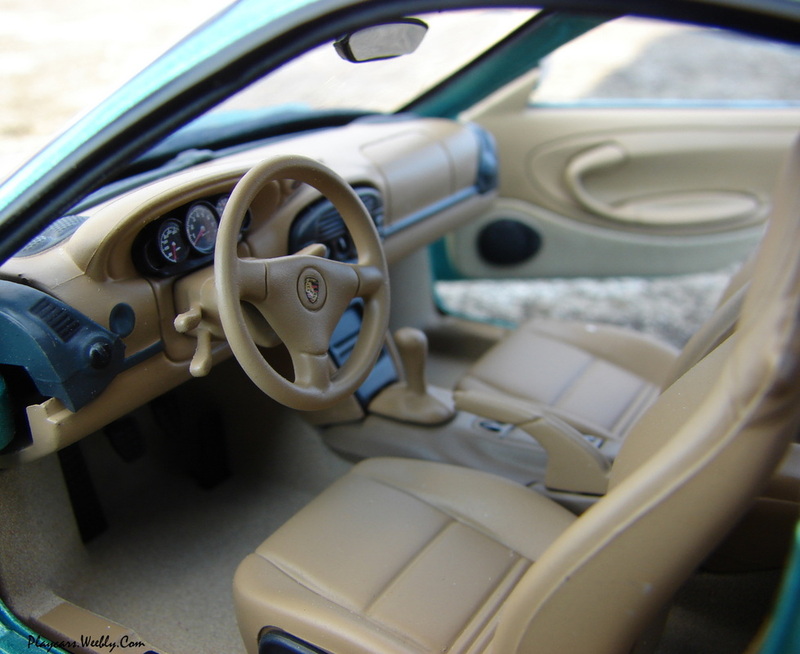 The interior is looking decent and detailed, but having big gaps in few places. I like the seats and steering wheel, very good modeled. Some buttons are replicated and for the indicators they’ve used a legible sticker. No carpet on the floor, just a textured material to replicate it. The general look of the interior could be find on the first Porsche models made by AutoArt, but better detailed and finished. 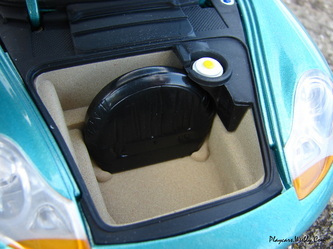 Under the front lid, two containers, separately painted and the spare wheel were replicated. The same textured plastic took the carpet place. 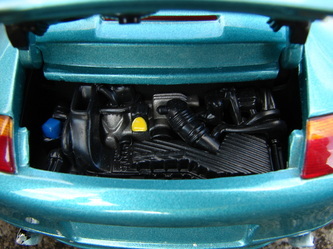 In fact this compartment is nice detailed. Not the same thing I can say about the engine bay, where only a modeled plastic base with minimal colors accents, try to remind us about the 6 cylinders masterpiece from the real car. It keeps the poor profile on its visible part underneath, too. If the problems with the rims and painted plastic on the rear side aforementioned, weren’t present, the model could be considerate much better than many new entry level models. In fact is it, and if you are lucky enough you can have a model without paint problems and with good rims as long as you’ll not touch them. 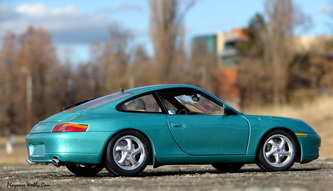 In my opinion UT’s are still models to collect because many were not reproduced by other brands and some colors are fantastic. Now depends on you, to take a decision.